I’ve never lived anywhere with heavy trick-or-treat traffic, but I imagine that as you hurl fistfuls of candy corn or whatever onto the porch at your neighbors’ kids, you want to come back inside to something better than the fun-size mediocrity you’re pushing. Maybe that’s the real Halloween trick—dispensing pouches of individually-wrapped “meh” masquerading as treats while you’re inside chowing down on, for instance, three flavors of OREO truffles dressed in tiny costumes of their own. Yeah! TRICK! I’m calling this a single recipe, but technically, the following variations can be combined in as many as nine different ways. 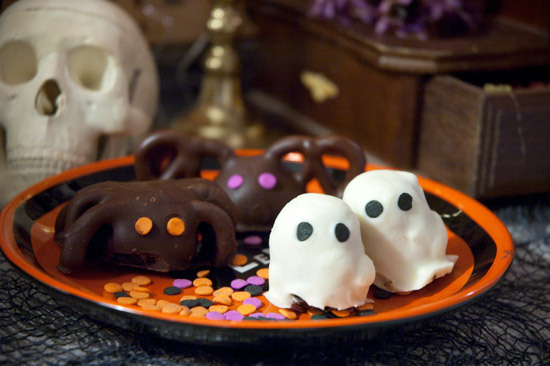 Choose from three OREO truffle flavors (OREO, OREO-cappuccino and OREO-coconut) and three different decorating techniques (spiders, bats and white chocolate ghosties), or make a whole assortment. Each variation begins with the same basic recipe, wherein you destroy a bunch of cookies and some cream cheese in the food processor to make the filling, then mix in a few hand-crumbled cookies for crunch. The flavor variations are simple one-ingredient additions and the decorating (with or without pretzels) is easy enough to do with kids. Probably. As usual, I haven’t tested the claim that this is good for kids. I did do it in front of a cat, but that’s a little different, unless your kids are dumb and very bossy. Oh, one other thing: scroll to the end of this post for details on how to win an OREO prize pack. Treat! Now, there are very few things in this world that I have not tried on ice cream. Anything in the pantry, from cereal to potato chips, is a viable ice cream topping. 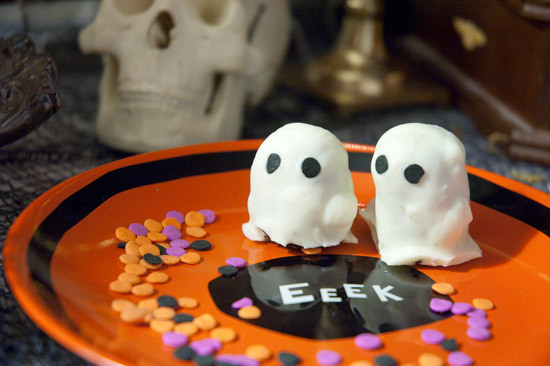 That’s how I came to discover that OREOs, white chocolate, and coconut are so good together, and that’s the basis for these funny little ghosties. This is also the easiest of the three decorating techniques, for sure. Just try to keep your white chocolate layer light so that it won’t overwhelm the soft truffle filling. Put all but six of the OREOs into the food processor and destroy them. I mean, really obliterate them and make them look like dirt. Add the cream cheese and continue obliterating until you have delicious cookie paste. Stir in shredded coconut. Crumble remaining OREOs by hand and stir those in as well. Chill 20 minutes. Line a tray with wax paper. Roll the OREO mixture into 1″ balls, then roll each ball into an oblong and flatten one end so it stands up in something like a bullet shape. Place oblong truffles on wax paper and chill again, another 20 minutes. Melt white chocolate, adding a drizzle of vegetable oil if it’s too thick. 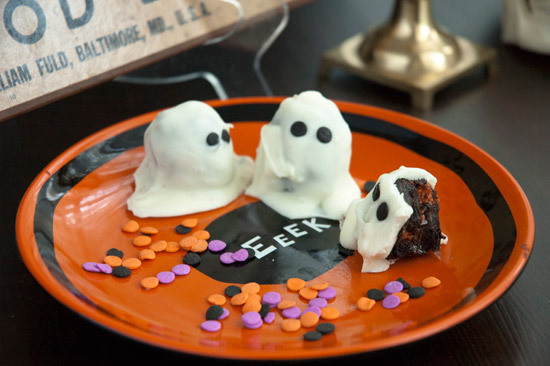 Dip truffle oblongs in chocolate and return to wax paper to set, allowing the extra chocolate to drip down and pool at the base of each ghost. Stick two black sprinkles into the still-soft chocolate to make eyes. Chill finished ghosties until ready to serve. These didn’t turn out to look quite as much like bats as I’d hoped, but they’re yummy enough to get away with it. Give the truffles plenty of time to chill after you attach the wings so that they won’t fall off while you’re trying to coat them in chocolate. Put all but six of the OREOs into the food processor and pulverize into cookie dirt. Add the cream cheese and continue pulverizing until you have delicious cookie paste. Crumble remaining OREOs by hand and stir them in. Chill 20 minutes. Line a tray with wax paper. Roll the OREO mixture into 1″ balls. For each truffle, break or cut the bottom part off of two pretzels and jam them into the sides of the truffle to make bat wings. Place bat-truffles on wax paper and chill again, another 20 minutes. Melt chocolate, adding a drizzle of vegetable oil if needed to thin. Dip bat-truffles carefully in chocolate, return to wax paper to set, and stick two purple sprinkles to the unset chocolate for eyes. Chill finished bats until ready to serve. These classic truffle spiders have all the horrifying charm of real tarantulas, but I bet they taste a lot better than the genuine article. Be patient when snapping the shoulders off your pretzels, and expect some pretzel-casualties. If you have helpers, pretzel-snapping is a very good job to outsource. Put all but six of the OREOs into the food processor and pulverize into dirt. Add the cream cheese and cappuccino powder, and continue pulverizing until you have delicious cookie paste. Crumble remaining OREOs by hand and stir them in. Chill 20 minutes. Line a tray with wax paper. Roll the OREO mixture into 1″ balls. For each truffle, break or cut the two upper rounded parts off of four pretzels to make eight curved legs, and jam them into the circumference of the truffle, leaving room in the front for his eyes. 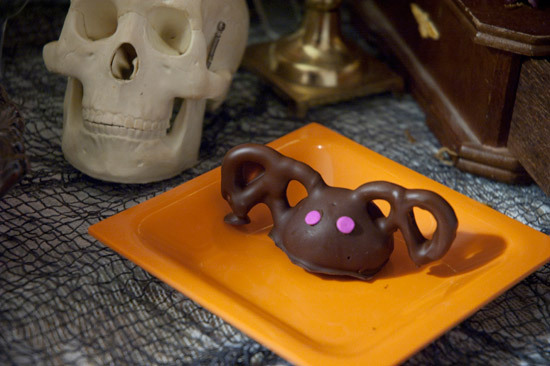 Place spider-truffles on wax paper and chill again, another 20 minutes. Melt chocolate, adding a drizzle of vegetable oil if needed to thin. 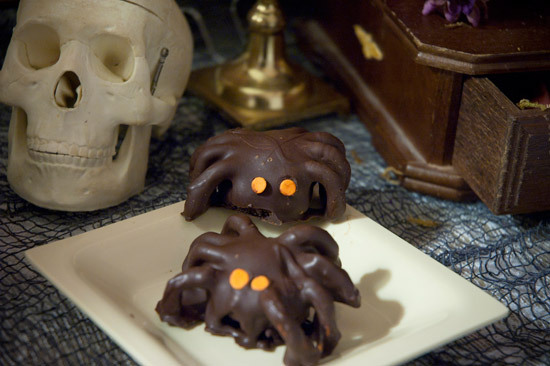 Dip spider-truffles carefully in chocolate, return to wax paper to set, and stick two orange sprinkles into the still-soft chocolate for eyes. Chill finished spiders until ready to serve. If three variations aren’t enough, take the everything-is-a-topping approach and try adding more things to your truffles. For instance, you can replace part of the cream cheese with peanut butter, stir in some toffee chips, or coat the outside with candy melts in different colors and flavors (like butterscotch or peppermint). OREOs go with almost everything, and truffles are really versatile. That’s the nice thing about making candy. Plus it looks really cute, and it’s super fun to clean chocolate off every surface in your kitchen when you’re finished. One of those things was not true. TRICK! 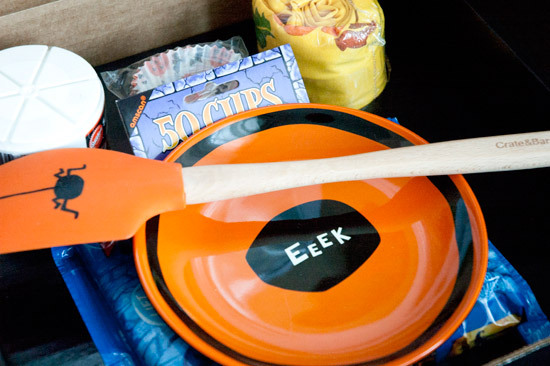 Kitchen PLAY sent me this OREO Halloween prize pack, so I can attest to its cuteness. It contains a spider spatula and serving dish from Crate & Barrel, a fall apron, Halloween cupcake papers and sprinkles, recipe cards, and a package of Halloween OREOS. Now Kitchen PLAY is giving away two more prize packs just like it. 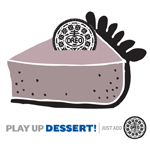 You need your own blog or website to enter, but it’s easy: simply recreate any OREO dessert from this Kitchen PLAY event, or come up with your own. Post about it on your site and provide a link to your post in the comments here on Kitchen PLAY. Multiple entries are allowed, as long as a separate OREO dessert post is created for each entry. Deadline is midnight Eastern time on November 5. This sweepstakes will also take place at Thanksgiving and the holidays, so the earlier you enter, the more chances to win! Full sweepstakes guidelines can be found at Kitchen PLAY. Note: In case you haven’t guessed, this post is graciously sponsored by Kitchen PLAY and OREO. The opinions and choice of recipe and ingredients contained are my own.